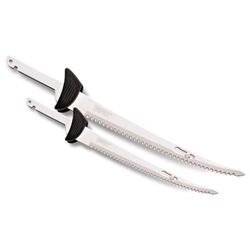 The blades that ship with the Rapala Electric Fillet Knives are designed to last the life of the knife. On occasion, one may get lost or damaged from misuse. Anglers who fillet bigger species will want to upgrade to the 9" model. The Rapala Replacement Blades are available in two sizes, all of which will work with every model of Rapala Electric Fillet Knives.